It’s called Hellcat. Dodge claims its 707 horsepower 6.2-liter supercharged V-8 engine makes this Charger the most powerful sedan in the world. On the quarter mile dragstrip, you’ll trip the timer in just 11-seconds – on street tires! We won’t argue. After a week with the Hellcat, we were looking for a dealership to take our order but couldn’t find one. You see, Dodge quit accepting orders for this American supercar in March because of unprecedented demand and limited parts. The 2015 SRT Charger Hellcat exterior includes a new Dart-like front fascia, specially vented hood, a unique rear fascia and a spoiler. The 20-inch forged aluminum wheels come in matte black, but a Brass Monkey/Dark Bronze finish is available. 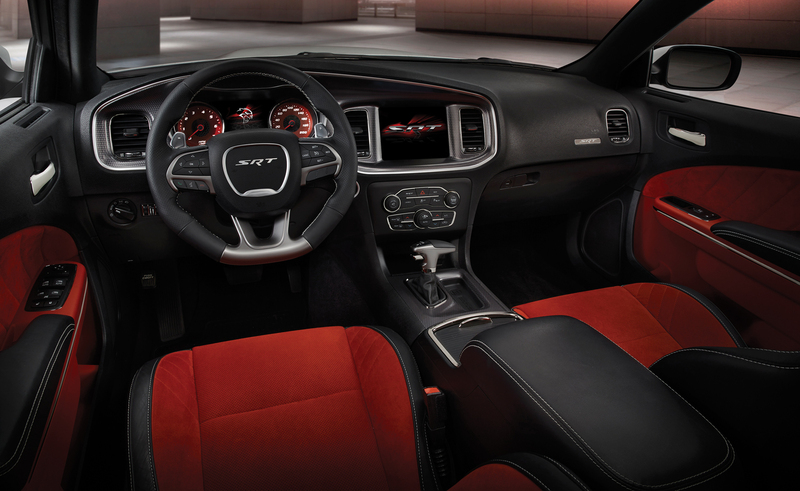 The interior features redesigned SRT seats with improved cushioning and more comfortable contours. Soft-touch materials are found throughout the cabin as well as a new 7-inch thin-film transistor instrument cluster. The center stack houses the 8.4-inch Uconnect touchscreen media center. We feel this is the best interface on any car on the market. 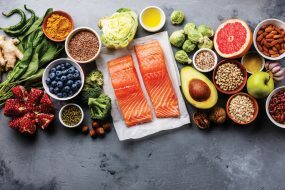 Check it out and we think you’ll agree. 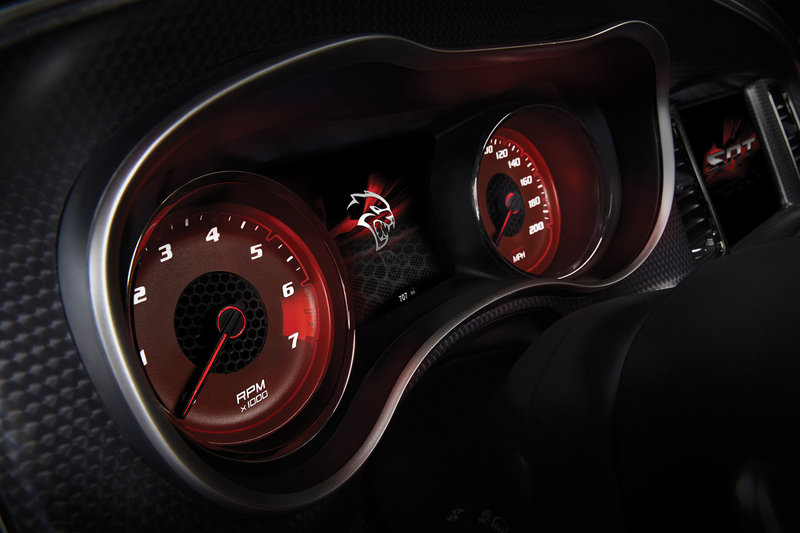 Within the touchscreen menus are new SRT Performance Pages, which allow drivers to tailor the driving experience by controlling horsepower, transmission shift speeds, paddle shifters, traction control and suspension. For Saturday night NHRA Drag Racing, there’s even a launch control, that will let you adjust the starting line engine RPM. The Dodge Charger SRT Hellcat features two key fobs – one black and one red. The red one unlocks all 707 horsepower – in case the 500 horsepower black-key doesn’t do it for you. With zero to 100 MPH speed taking just under 13 seconds, bringing this cat to a stop is real important. 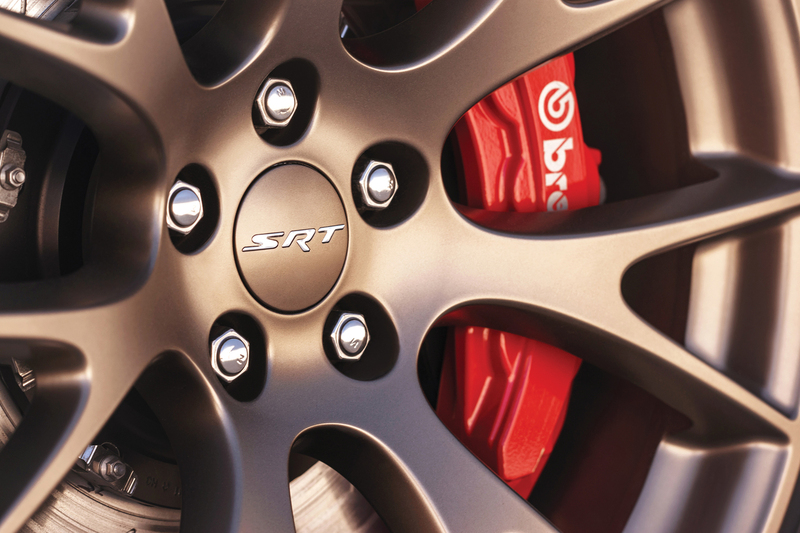 The largest front-brake package ever offered in a Chrysler vehicle comes standard on the Hellcat with 15.4-inch two-piece rotors and six-piston calipers. This powerful 4-door can serve as a daily driver or a highway cruiser, since the adjustable suspension tames the ride when not provoked. Mileage, however, is what you’d expect; 13-city and 22-highway. Only an 8-speed automatic transmission is available. I guess only the old guys still like the do-it-yourself kind. If you think a 4-door was never meant to be a performance car, Charger Hellcat has a 2-door cousin; the Challenger Hellcat. 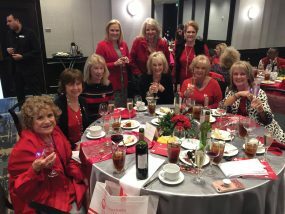 This may be the perfect alternative for the empty nester who mostly drives alone. 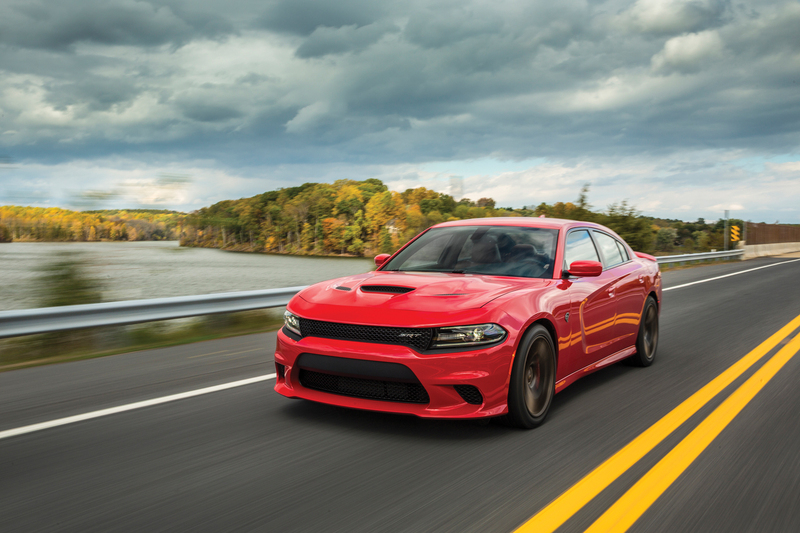 The Hellcat starts at $62,295. Listen to In Wheel Time every Saturday 9 AM to Noon on Yahoo! Sports Radio 1560am.